Do you know any kids that don't like to do crafts? I actually don't. Baby E? She's a craftaholic. I love that she is so creative, but sometimes I just don't have time to set aside and get crafty with her. 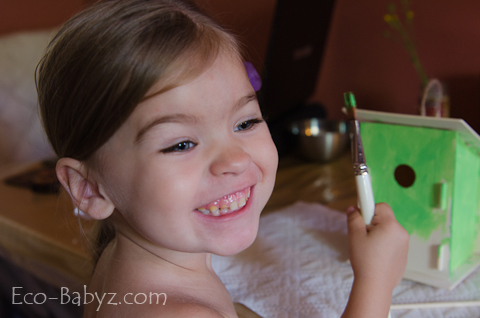 That's why I was really excited about being contacted by Green Kid Crafts! This monthly subscription service saves you time and 'forces' you to spend some time crafting with your kids by delivering Eco-friendly crafts to your door. It's a fabulous idea, and as I often say - "Why didn't I think of that?" I come from a very artistic background. In fact, I am a professional Interior Designer and got my bachelor's right before marriage. I contemplated getting a photography degree, but chose Interior Design, my second love. I love to draw and have had art classes ever since I was six, all through childhood and my teenage years. Art has shaped me in so many ways. So needless to say, I do often feel guilty that I don't sit down for some arts and crafts with my toddler every day. When the package arrived we quickly opened it because we were curious to see what's inside. There were three craft kits included, a bird house, a telescope, and an owl brown paper bag puppet. The first one is actually something my daughter has been begging for since April, so that's the one we decided to do first. I just love how pretty much everything we needed came in the kit. 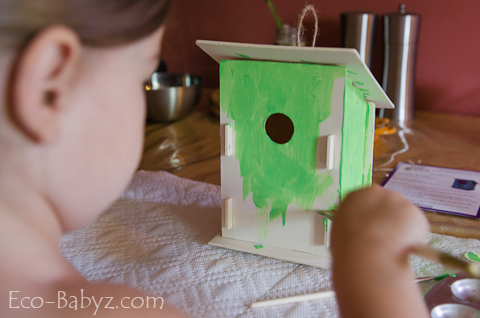 Here are the parts included for the bird house, along with simple directions. The brush was a little too small/thin, so we decided to use our own paint brush. 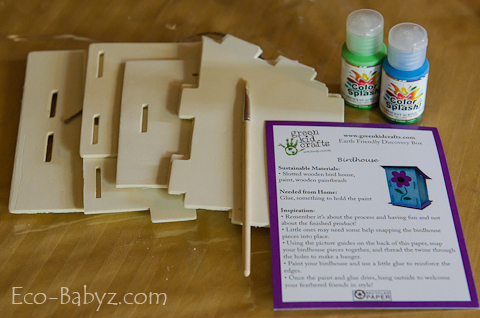 There was also a need for some glue at the end to secure the bird house, other than that everything was in the kit. We started by putting it together first, it was very intuitive, Baby E just needed a little help - but not so much that I had to hover over her. Here is the assembled bird house before we painted it. Painting was her favorite part! I think she just loves it for the potential of the mess she could make with this. Ha! Perhaps it feels mischievous for her to be changing the color of something, glad it isn't our sofa or kitchen cabinets. 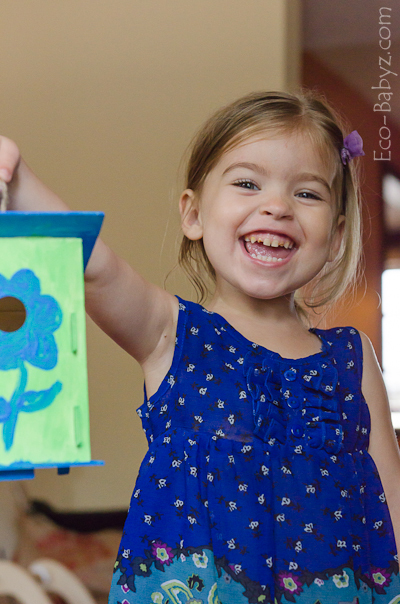 Yes, that's just one of the reasons kids need crafts - so that they can get their creative energy out on something you will not be mad at them about! 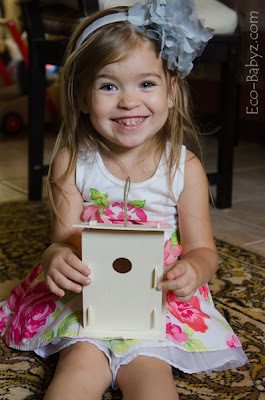 This is the completed bird house. Rather I should say, this is how excited Baby E was to complete the bird house! I love seeing her happy face when we create something. I love that it takes so little to make her happy. Even when we just sit down and draw happy faces on plain paper with a pencil, she is just as enthusiastic. We can't wait to make the other crafts with her as well! The monthly subscription only costs $19.50 per month (including shipping), really a steal for the crafts ready to be made with your little one. A subscription for 2 children is $29.50 a month and a yearly subscription is $214.50 for one child or $334.50 for two children. 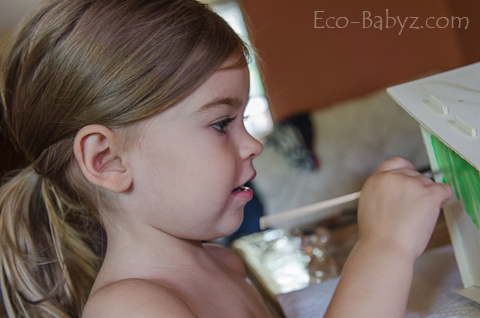 PLEASE VOTE FOR OUR PHOTO PICTURED ABOVE FOR ECO-BABYZ TO WIN A CHANCE TO GIVE AWAY A GREEN KID CRAFTS SUBSCRIPTION TO OUR READERS! 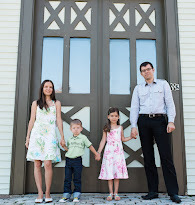 $0.50 WILL BE DONATED TO Healthy Child Healthy World FOR EVERY VOTE! I voted for you! Your picture is the best and cutest by far! I really the craft which you have made.I really liked it.